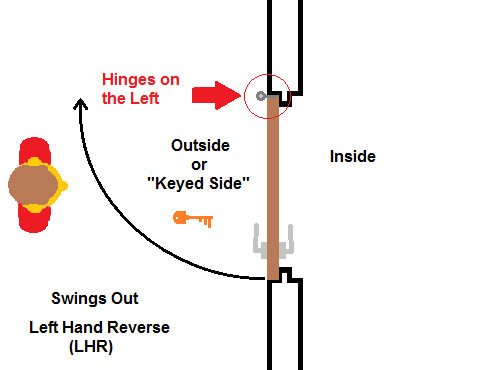 Handing refers to the direction of the door swing as it is opened. The best way to begin determining the handing of an opening is to determine the “secure side” of the opening. 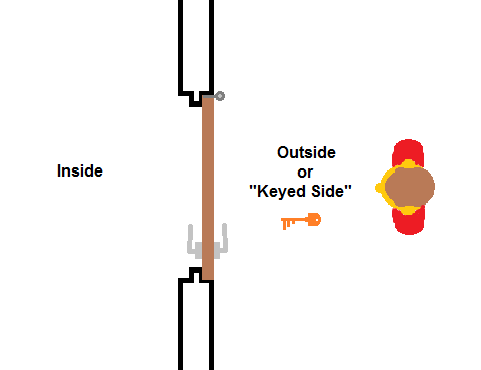 In Division 8, we like to think of the “secure side” as the side where a key would be required to enter the room or space behind the door. 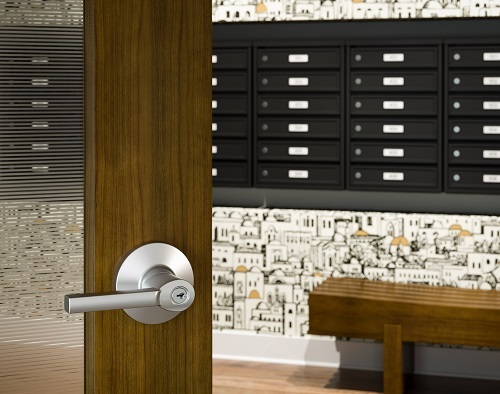 Handing is frequently an important detail for finish hardware as well as for doors and frames. 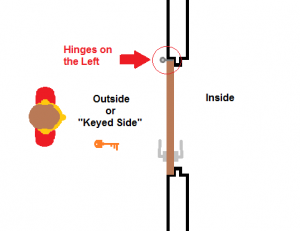 If we do not specify the correct handing, we can end up with hardware, frames, and doors that are backwards. 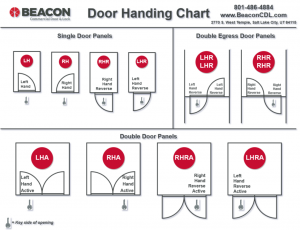 We will start by talking about handing a single door panel. 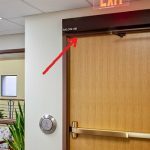 Then we will cover the handing of double doors. 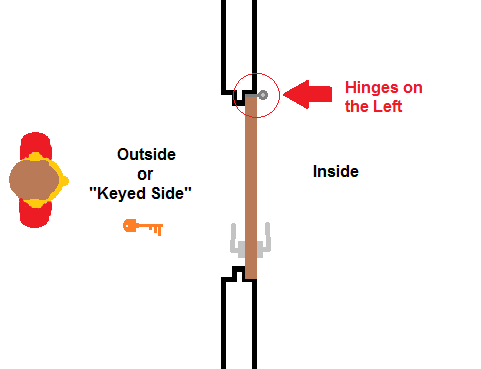 Because the term “secure side” can be confusing to some, for the purposes of this post we will refer to the secure side as the “keyed side” of the opening, meaning the side of the opening that would require a key for entry. Once we have determined the “keyed side” of the door we next look to see which stile of the door panel the hinges are on. 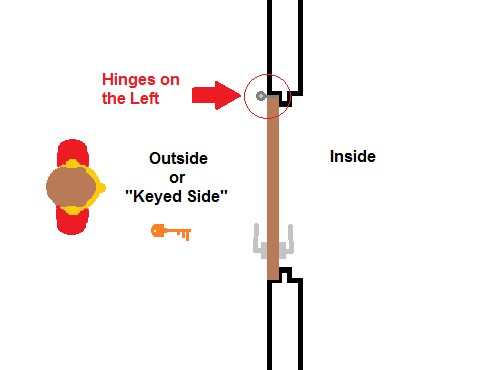 The hinges will be on either the right or left stile of the door. This is how we determine if it is a left hand swing or a right hand swing. 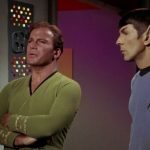 But there is still one more thing we need to determine before we are finished with handing. 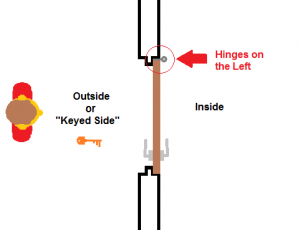 Once we’ve figure out the hinge stile (right or left) then we determine if we are pushing the door to open it (swings in) or if we are pulling to door to open it (swings out). 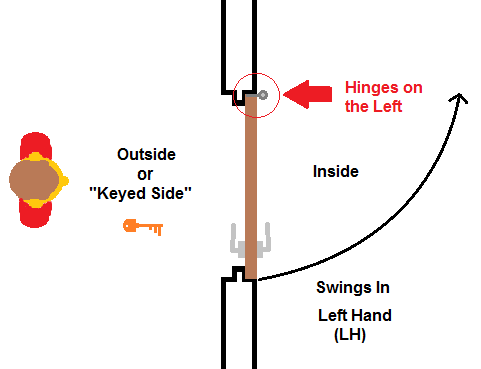 If we are pushing the door open, it is a standard swing (sometimes called a “standard bevel”). 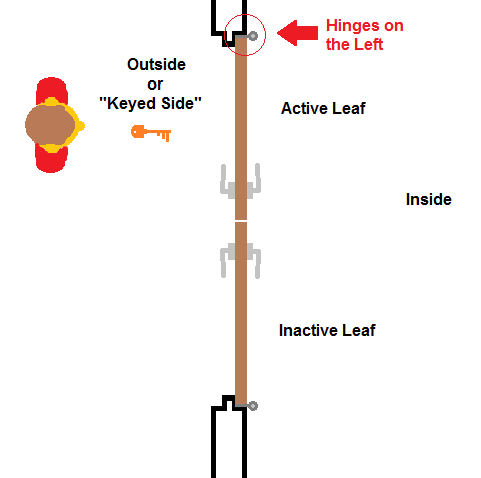 If we are pulling the door open, it is a reverse swing (sometimes called a “reverse bevel”). 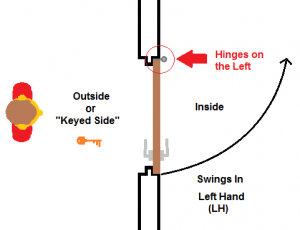 Left Hand Door Swing (LH) – Hinges on the left stile of the door panel and as we push the door open it swings in. 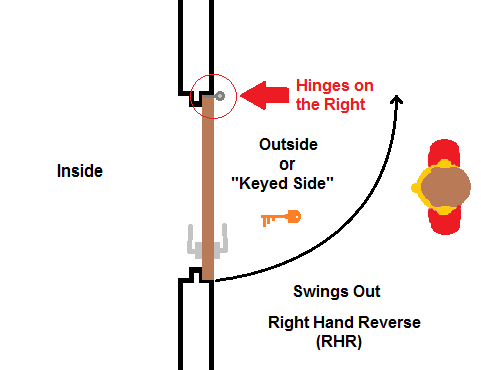 Right Hand Door Swing (RH) – Hinges on the right stile of the door panel and as we push the door open it swings in. 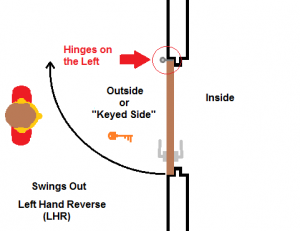 Left Hand Reverse Door Swing (LHR) – Hinges on the left stile of the door panel and as we pull the door open it swings out. 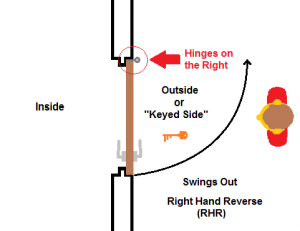 Right Hand Reverse Door Swing (RHR) – Hinges on the right stile of the door panel and as we pull the door open it swings out. Next we will look at handing for openings with double doors. 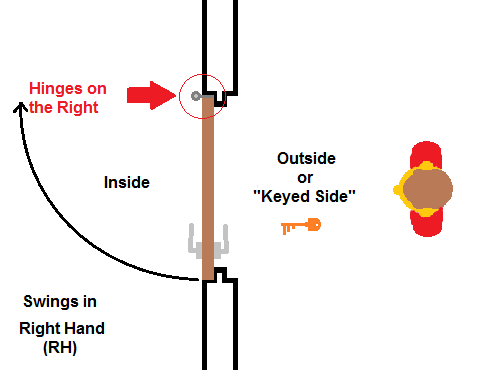 When determining the handing of double doors, the first thing we determine is which side of the opening would require a key for entry, similar to a single door. 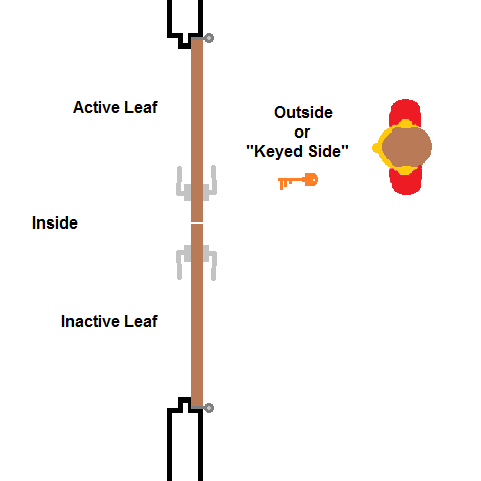 However, because there are two door panels we also have to determine which leaf is the “active” leaf and which leaf is the “inactive” leaf. 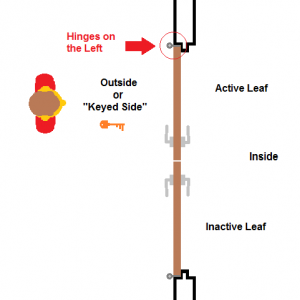 The active leaf is the generally the door panel that has the locking hardware requiring the key. 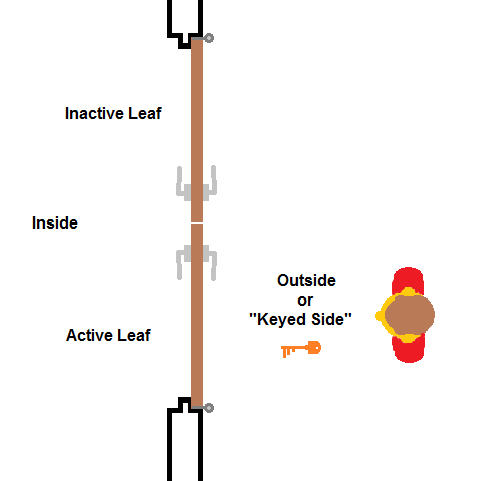 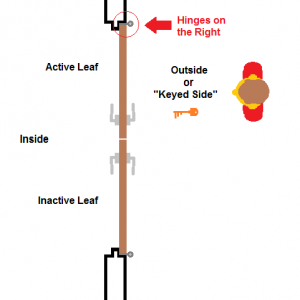 The inactive leaf is generally the door panel that does not have the hardware requiring the key and remains secure until the active leaf is opened. 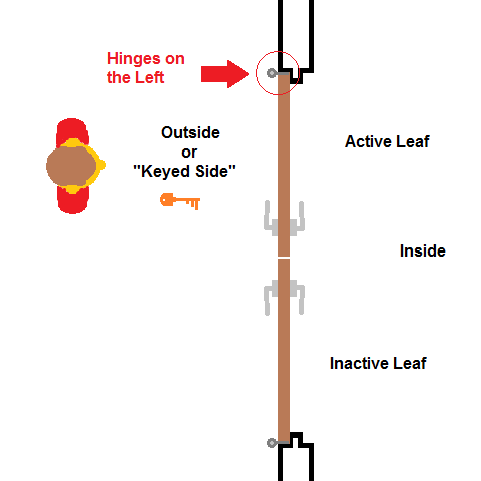 The inactive leaf doesn’t usually even have a lever, but often has flush bolts that are not accessible until the active leaf is opened. 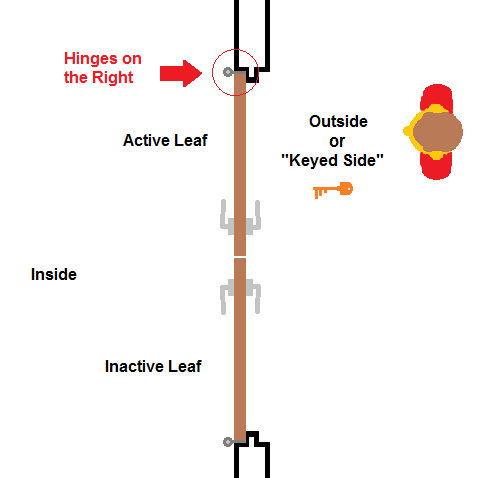 Once we have determined the keyed side of the opening and which leaf is the active leaf (right or left door panel), then we determine which stile of the active leaf the hinges are on (right or left stile). 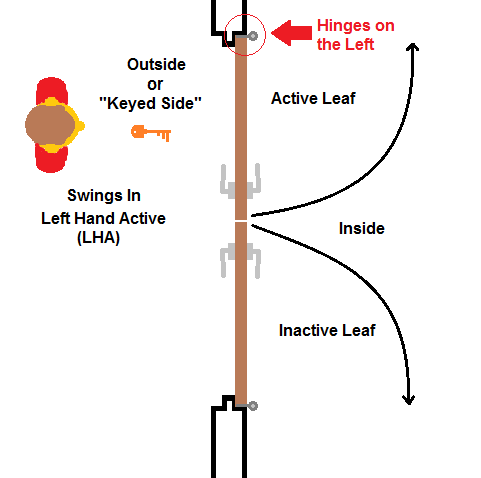 This is how we determine if it is a left hand active swing (meaning the active leaf is a left hand swing) or a right hand active swing (meaning the active leaf is a right hand swing). 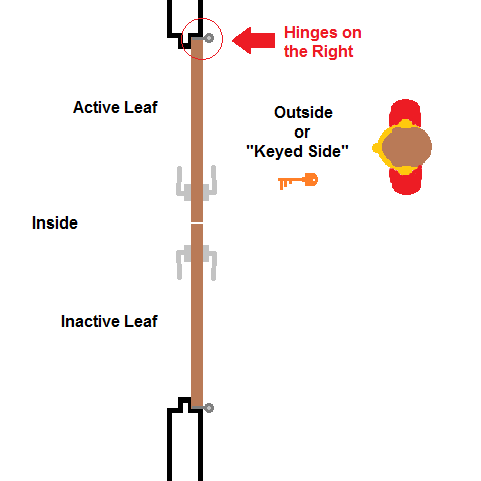 Double door handing is determined by the active leaf. 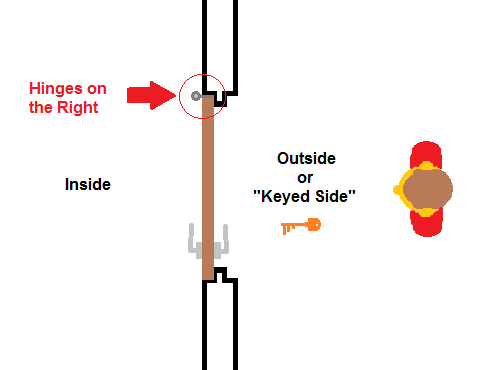 Finally, we determine if we are pushing the door panels to open them (doors swing in) or if we are pulling the door panels to open them (doors swing out). 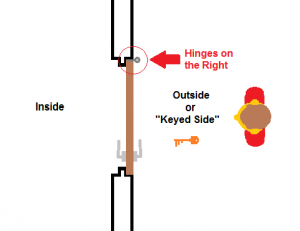 If we are pushing the doors open, it is a standard swing. 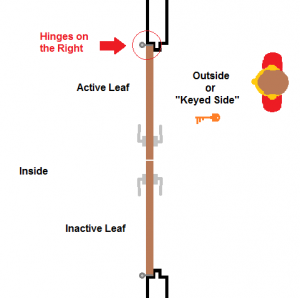 If we are pulling the doors open, it is a reverse swing. Left Hand Active (LHA) – Left door panel is active leaf, hinges are on the left stile and as we push the door open it swings in. 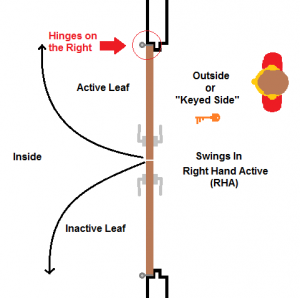 Right Hand Active (RHA) – Right door panel is active leaf, hinges are on the right stile and as we push the door open it swings in. 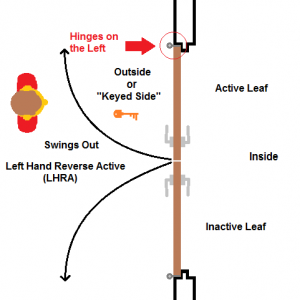 Left Hand Reverse Active (LHRA) – Left door panel is active leaf, hinges are on the left stile and as we pull the door open it swings out. 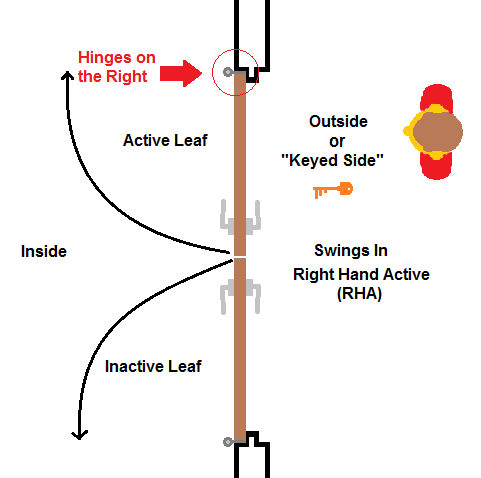 Right Hand Reverse Active (RHRA) – Right door panel is active leaf, hinges are on the right stile and as we pull the door open it swings out. 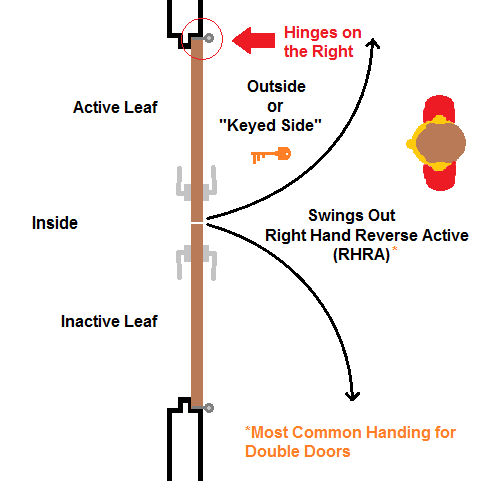 The Right Hand Reverse Active (RHRA) handing is the most common for double doors. 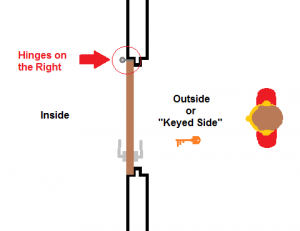 Click here to download a copy of a simplified door handing chart.